Our seeds are 99.9 % feminized seeds! 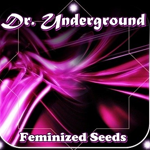 Dr Underground makes their seeds in hydroponic systems to control the different parameters. All the strains were also tested in different grow systems and they\'re compatible in all grow systems.